So, overall, it's a pretty crankin' system. The ADAM was only produced for 2 years. I had thought that it just disappeared after that, but I was wrong. There's a thriving ADAM cult. There is even an annual ADAM convention. The next one is July 15-18, 1999. See the Official ADAMCON Homepage on Bob Slopsema's Adam site for more details. View from above with cover off. Shows the expansion slots. The dreaded power switch on the back of the printer. Hope it doesn't break, and take your tapes out before you switch it on. Adam keyboard with lots of nice special function keys. It has a real nice feel, too. 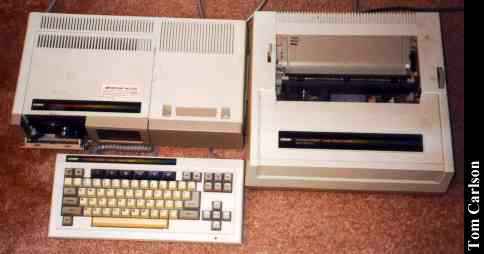 Click here to view all comments for the Coleco Adam and to leave your own. 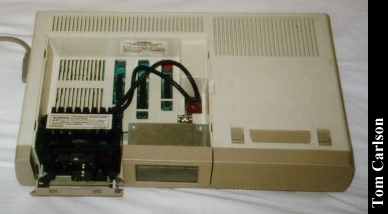 Click here to view comments about other Coleco computers.